Register for a Testmasters FE-CBT Test Prep Course. The FE-CBT, which stands for Fundamentals of Engineering – Computer Based Test, is a test created by the National Council of Examiners for Engineering and Surveying (NCEES). It is also known as the EIT/FE, which stands for Engineering-In-Training/Fundamentals of Engineering, or just as the FE exam. It is typically the first step in the process leading to the P.E. License. It is designed for recent graduates and students who are close to finishing an undergraduate engineering degree. To learn more about the FE-CBT, click here to take a look at our FE-CBT FAQ. What Test Preparation options does Testmasters offer for the FE-CBT? Classroom Course – Taught live and in-person, this course is ideal for those who are most comfortable in a typical classroom setting. Online Course – Taught from online videos and printed course materials, this course is ideal for self-motivated individuals or for those who need a more flexible schedule. Group Course – Testmasters is willing to work with businesses, universities, or other groups of sufficient size to create a custom course following the classroom course format. 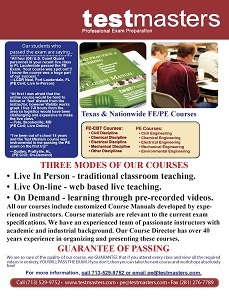 Learn more at the FE-CBT Custom Group Course page. To learn more about the Classroom Course or Online Course for a specific discipline, first select the discipline that you’re interested in. Why Testmasters FE-CBT Exam Test Preparation? We guarantee you will pass the FE-CBT exam. If you attend every class of the review course and workshops and view all the required videos and don’t pass, you can repeat the next review course and workshops absolutely free. Read more about the Testmasters FE-CBT course and guarantee. The Testmasters FE Exam Test Prep Course is designed for students who have been out of school for a while. We realize that you may not have practiced many of the topics covered on the exam since college. Our focus is to give you a concise, intensive, and structured review of the important topics needed to pass the exam, and we use our workshop sessions to ensure that you get the practice applying these topics in a problem-solving environment. Testmasters has the best teachers. The Testmasters FE Exam Test Prep Course Coordinator has taught EIT, FE-CBT, and PE courses for over 35 years, and is very well versed with the format of the exam and what it takes to pass it. The Testmasters course is focused only on the exam and helping students pass. Our instructors come from the industry and academia, and are highly qualified in their specialized fields. They have taught EIT, FE-CBT, and PE courses for many years at various companies including Central and Southwest Services, Bechtel, Kellogg, Fluor, Sirrine, Lummus, Ericsson, Texas Instruments, Foster Wheeler Energy Corp., Texas Department of Transportation, Virginia Department of Transportation, Utility Engineering, and the City of Austin Electric Utility Department. Testmasters has outstanding course materials. The course is very comprehensive, with 78 hours of instruction for the FE-CBT courses and 72 hours of instruction for the PE. In the Testmasters FE-CBT course, concepts are reviewed and many problems are worked out in class. This helps students become familiar with solving problems that are similar to what is on the exam. The Testmasters course is different from college courses, which are designed for their students and cover theory. The course is focused on the exam and helping you pass. How Do I Register For A Testmasters FE-CBT Test Prep Course? There are a few options to register for a Testmasters FE-CBT course. You can register online at our website, or you can print out the registration form, fill it out and fax or mail it to our office. Our fax number is 713-529-4394. You can also call our office at 713-529-9752 and register over the phone. Does Testmasters offer registration discounts to full-time undergraduate students? Full-time undergraduate seniors will receive a 50% discount off of the regular fee when taking the FE-CBT review course and workshops. No other discounts will be given. Proof of full-time enrollment status (12+ credit hours) must be submitted with the registration form before the discount will be given. This student discount is not offered for the FE online courses or PE courses. The student must be a senior at a university and get the discount before joining the course.